A repeat booking is a good chance to improve on everything that went wrong first time around! Lots of factors go into making a good recording, but the most important one by far is the music that's being recorded. The whole business becomes a whole lot easier when the thing you're pointing your microphones at is actually making a nice sound! Sometimes we're lucky, and nice sounds come to us without any prompting, but it often pays to get out and look for promising acts. The recording rig. Needless to say, I jumped at the chance, and spent a day on location with the band and my friend Steve Fenton in April 2012. They laid down seven or eight songs completely live, but all three band members write, so they had many more in their repertoire, and we were all keen to schedule another session. As the band members are all postgraduate students, they weren't around all the time, but we eventually fixed on a date in March 2013. This would be in the same venue — a local primary school hall — with the same personnel. Although we were all fairly happy with the original session, both the band and I felt that there was room for improvement in our respective contributions. First time around, it had been no problem getting a great vocal sound from the band's female singer, Anja Baum, because she's an incredible vocalist and her instrumental contributions — mainly percussion and second guitar — could mostly be treated as secondary to her voice. Male vocalists Conor Daly and Jason Signolet are also fine singers, but recording them had proved more of a challenge. Conor's acoustic guitar and Jason's piano playing form the core of Reckless Play's backing, so in both cases, I wanted to try to capture voice and instrument with a decent amount of separation. On top of this, Conor turned out to be the most sibilant vocalist I've ever encountered, while Jason's piano parts took him all over the keyboard, making it hard for him to stay on the mic at all times. When I came to mix the first session, I felt that I hadn't done the best job I could on either singer. 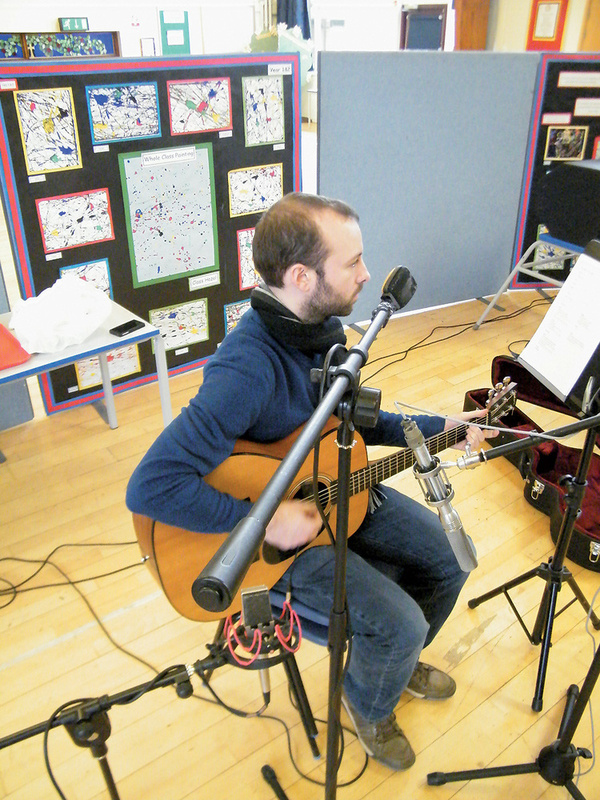 The stage mic I'd used on Jason's vocal produced a decent amount of separation but didn't suit his voice; with Conor, even the ribbon mic I'd eventually used had proved sibilant, and it hadn't delivered a particularly good tone. At the second attempt, I was also hopeful of improving the way I had captured the school's grand piano. It was never going to be a Steinway D, but in my haste I'd miked too near the hammers, and hadn't achieved the best possible phase relationship between the two mics; this, compounded with spill into other mics in the very ambient hall, had made it hard to get a nice up-front piano sound. For their part, the band felt that some of their performances in the first session had been too variable in tempo, and were keen to try recording to a click where they felt a song needed to keep strict time. This raised the question of how best to give a click track to the band without undermining the immediacy of live recording: unless people are used to hearing their bandmates through headphones, it can be a disconcerting experience, and one that involves a lot of time-consuming faffing about. When I arrived at the session, I also found that the band had sprung a couple of surprises. For one thing, they had beefed up Anja's role as percussionist, by incorporating a rather dilapidated bass drum and pedal and, er, a coffee table. For another, they too obviously had reservations about the piano sound, as they'd brought their Clavia Nord Stage keyboard. This forced me to make a decision that would send the session down one of two very different paths. Should we stick with the school piano as planned, despite its honky tone and increasingly desperate need for the attentions of a tuner? Or should we embrace electronic perfection instead? The factors that swayed me against using the Nord were threefold. I have to confess that the first one was sheer bloody-mindedness: we had decided to use this particular venue mainly because it did have a grand piano, and if I'd known we weren't going to need it, I'd have chosen somewhere with more friendly acoustics! 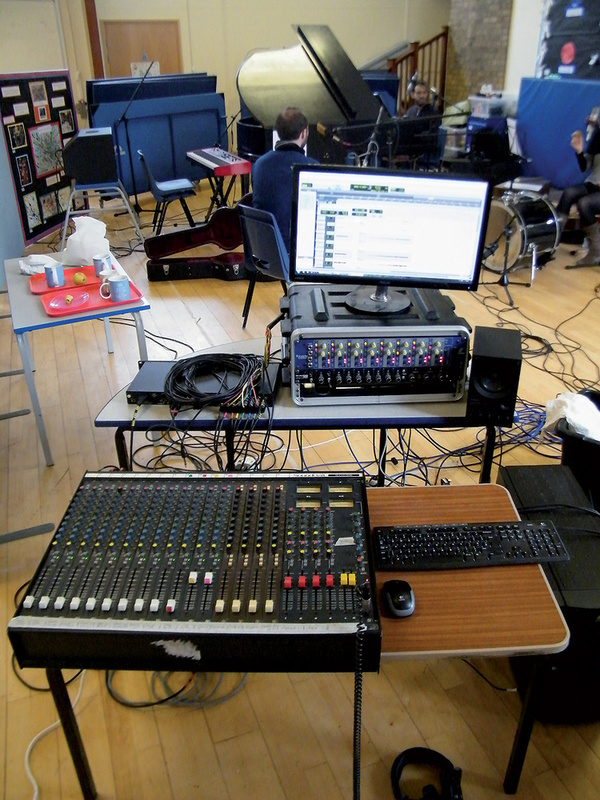 The second, related factor was that I didn't want to end up painting myself into a corner at mixdown, trying to fit a completely dry piano signal into a recording that would bear the character of the hall in a very obvious way. The third was that I hadn't planned to set up any sort of foldback for the band, and was concerned that giving everyone headphones would cause their performances to suffer. As luck would have it, Steve had one of his HK Actor PA speakers in the car, so we tried setting that up as a monitor speaker for the Nord. In theory, this should have been the best of both worlds: it would obviate any need for headphones, and it would provide some room sound to help the piano blend into the mix. In practice, it sounded terrible. I made up my mind that we would use the real piano, warts and all. This time, however, I paid more care to the positioning of the piano itself. To try to cut down its spill into other mics and, indeed, the leakage its mics were picking up from the guitar strumming, we turned it so that it fired directly away from Conor and Anja, the lid effectively acting as a gobo (as you can just make out at the rear of the first picture in this article). We also found a number of room dividers and trolleys full of gym mats, and surrounded the band with them in the hope of drying up the hall a little. 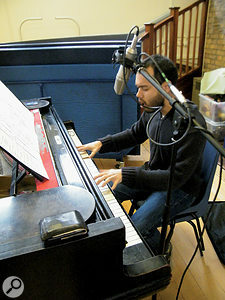 I used two Neumann KM84s to mic the piano, as I'd done first time around, but positioned them further towards the end of the instrument, away from the keyboard and hammers, in a spaced pair perhaps 12 inches above the strings. Anja Baum alternated between playing percussion and acoustic guitar and, unfortunately, her guitar did not have a pickup in it. Since she has a very powerful voice and plays very quietly, this meant that most of her guitar parts had to be overdubbed. My Neumann U77 (a T-powered large-diaphragm capacitor mic that is either a solid-state successor of the U67 or a predecessor of the U87, depending on who you ask) had served very well for Anja's vocals first time round, so I had no hesitation in putting it up again in that role. Since the first session, I had bought a U87 as well; this seemed to suit Jason's voice, and compared with a stage dynamic, its relatively wide cardioid pattern coped better with the inevitable head movements. The increased distance between vocal and piano mics seemed to help with the phase issues, too. The setup used for Conor's voice and guitar remained constant for the session. 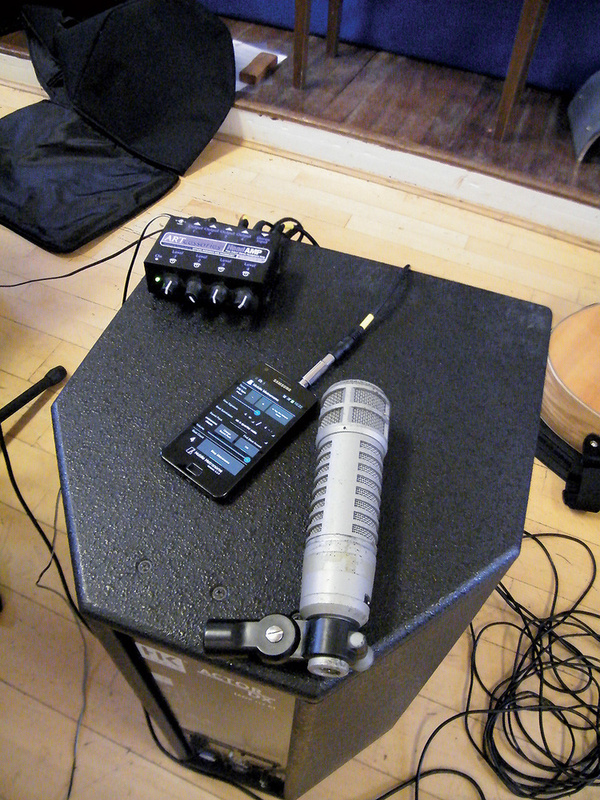 The large silver mic is a Pearl ST8, operating in Mid/Sides mode with both capsules set to figure-of-eight. 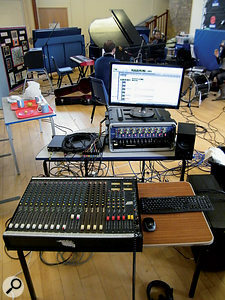 The C414 in the foreground, also in figure-of-eight, gave an alternative sound, but was only used in the mix when Conor used the guitar as a percussion instrument. Conor's voice hadn't become any less sibilant, so I didn't bother trying capacitor mics this time around but, after another failed flirtation with ribbon mics, settled on a Sennheiser MD509 (which is the same as the more common 409, apart from the paint job). This is the smoothest-sounding dynamic mic I know of. It usually finds its way onto guitar cabs, but it worked fairly well in taming the esses. There was quite a bit of guitar spill onto the vocal mic, but in context it mostly seemed to enhance rather than upset the guitar sound. That just left Anja's guitar and percussion. Never having miked up a coffee table before, I pointed an Electro-Voice RE20 at it and hoped for the best. The kick drum, meanwhile, had lived a hard life and was really beyond tuning. Miked from the resonator head with a Shure SM7, it sounded like wet fish being slapped with a flannel, so I moved the mic round to the beater side. It now sounded like wet fish being struck with a squeaky drum pedal, which was an improvement, at least once we'd oiled the pedal. There was no way to control the pickup of the percussion in other mics, so it was obvious that the eventual kick sound would be roomy, to say the least. This made me a bit nervous, but the percussion was integral to several of the songs, so I couldn't see any option other than to run with it. In the event, the roominess probably improved the kick-drum sound, not that it could have made it much worse. 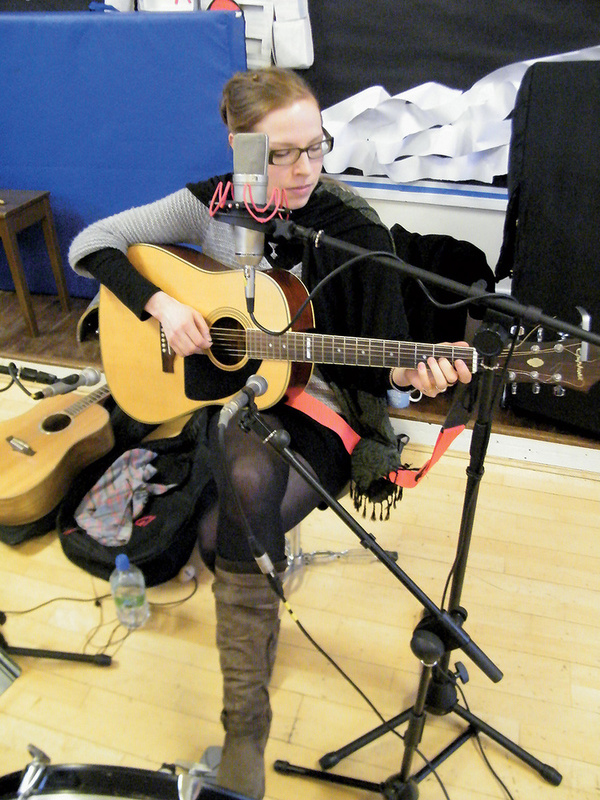 On our previous session, Anja had brought along a Spanish guitar. This had suffered some interesting tuning issues, but its under-saddle pickup had been quite useful at the mix, as she tended to play very quietly. This had disappeared, to be replaced by a conventional steel-strung acoustic with no pickup, which presented a bit of a headache. I put up a couple of AKG D19 dynamic mics as close as I could reasonably get them, but they still picked up more spill than guitar. In the event, Anja's guitar parts were rarely needed to drive the song along in the initial live performance, so we ended up overdubbing most of them. I was using this session to test out the Allen & Heath ICE 16 digital multitracker as a recording interface, connected via USB 2 to my Windows 7 PC. The ICE presents 16 line inputs, so I fed the first eight of these from my Focusrite ISA828 preamp, and the remainder from the insert points on an old Soundcraft 200SR mixer. The ICE's headphone output isn't really suited for this sort of work, so I monitored via the desk too, and I brought along a pair of small powered speakers for playback to the band. One thing I've found when working on headphones without a separate control room is that it pays to monitor in mono, even when miking in stereo. The potential for phase problems is considerable when you have 10 mics open in one room, and such problems are much harder to spot when the mics are panned in headphones. Although I'd prepared a click track in Pro Tools, in the event, it proved simpler for the band to continue using the smartphone metronome app they'd employed in rehearsal. I fed this only to whichever instrumentalist was leading the rhythm of a song.There remained the question of how to feed a click track to the band. I had taken the precaution of setting one up in Pro Tools, but in the end it proved easier to simply plug my ART headphone amp into an iPhone and use a metronome app, as this gave the band control over tempo and so forth. In most cases, rather than give everyone headphones, the click just went to whichever band member was providing the rhythmic drive on a particular song, and then into only one ear, so that the feel of a band playing in a room was preserved where possible. Click leakage from headphones can absolutely kill this sort of quiet acoustic recording, and it took quite a lot of experimentation with different pairs of phones and volume levels before we achieved a setup that they could hear and my microphones couldn't. Getting the recording rig set up and the mics positioned took all morning, and it was one o'clock before we were ready to go for a take. After that, however, things progressed pretty smoothly: even the unscheduled Biblical downpour that went on all afternoon was, thankfully, barely audible in the hall. The band were very well rehearsed, so there were few false starts and we needed to do only two or three full takes of most songs before we felt we had keepers. In total, we recorded seven songs as live band performances. Some of these were then overdubbed with one or two secondary parts such as shaker, additional backing vocals, Anja's guitar and, in one case, the Nord Stage. After a location session, I'm always anxious to check out the results at home as soon as possible, if only to reassure myself that nothing terrible has gone wrong. In this case, thankfully, the cold light of day didn't reveal any epic disasters. If anything, it came closer than usual to being one of those mythical sessions where simply pushing up the faders would produce a respectable mix. When I came to do the mix, though, the process of pushing up the faders became pretty involved. The band's material and performances were very dynamic and, like most singing instrumentalists, they didn't always stay perfectly on their mics. Heavy compression would have been inappropriate to the band's sound, and would have exaggerated the already prominent hall ambience. I ended up doing almost everything with level automation, and apart from the percussion, the only place I used a compressor was on the mix bus. Some remedial work with EQ was needed, however: something about the sound of this hall tends to lead to too much 2kHz on everything, and even though I'd used good shockmounts, quite a lot of low-frequency rumble had been picked up. More drastic work was necessary to carve a presentable sound out of the table and the kick drum, albeit probably no more than would be applied in a typical rock mix. If I'd notched all the undesirable resonances out of the piano, meanwhile, there would have been nothing left, but I did my best to tame its worst aspects. From previous experience, I knew that I could expect very detailed feedback from the band on both performance and balances, so I began by sending them rough mixes of all the complete takes. They came back to me a week or so later with a list of which takes, or parts of takes, they wanted to use, and we began a process of mixing and revising which went through three or four iterations. Location recordings are rarely perfect, but even with edits and overdubs, they still have a refreshing truthfulness about them. Unlike those painstaking studio projects that are built up track by track, they capture a 'warts and all' snapshot of an artist's sound. And when, as in this case, the artist has a great sound to start with, that has a lot to recommend it! The first time I recorded Reckless Play, I used a stage mic on Jason's vocals, and was not particularly happy with the result: the sound didn't suit his voice and its narrow pickup pattern meant that his natural movement at the keyboard took him off-mic too easily. This time around, a U87 set to cardioid pattern picked up more spill but gave a much nicer sound. The main areas where I'd been looking to do a better job, compared with the previous Reckless Play session, were in recording the male vocals and the piano. Oddly enough, however, perhaps the biggest improvement came on something I'd been pretty happy with first time around: Conor's acoustic guitar. Rather than use the dreadnought he'd played last time, I suggested he try a smaller-bodied instrument, and this in itself made quite a difference to the sound. I was also keen to experiment with a recent eBay find: a Pearl ST8 stereo capacitor mic from the '70s. Like a ribbon mic, the Pearl rectangular capsule has different directional characteristics in the vertical and horizontal planes, and used vertically in figure-of-eight, its ability to capture guitar while rejecting the vocal is pretty amazing. My current favourite technique for acoustic guitar, especially with singing guitarists, is to set both capsules to figure-of-eight and record in Mid and Sides stereo, with the Mid capsule pointing straight at the guitar and the Sides parallel to it. This has a few practical advantages that are useful, especially when time is short. In particular, you're not necessarily committing to using a stereo guitar sound at mixdown; you can position the Mid capsule as if you were using a single mic, knowing that you'll have, at the very least, a solid mono sound, and that if you do decide to use the Sides component at the mix, it won't affect mono compatibility or introduce phase issues. The disadvantage of this technique is that if you point the Mid capsule at the neck-body join, which is often the best place for a single mic, introducing the Sides component then pulls the sound off centre, as very little is picked up from the neck side of that capsule. In this case, I knew that I would want to pan the guitar and piano slightly to opposite sides in any case, so it didn't bother me. I was reasonably confident that the ST8 would do a good job on its own, but to cater for the unexpected, I ended up recording two more guitar signals, one from a Sunrise magnetic pickup and the other from an AKG C414 positioned just behind the bridge. As it turned out, the main problem with the guitar was getting it to sound in tune with the piano, which was neither fully in tune with itself, nor anywhere near concert pitch!